Though most of us have heard of the Bermuda Triangle, where planes and ships have mysteriously gone missing in the Atlantic Ocean for decades, not all are aware that there is a similar place in Nevada. Lying in a region of the Sierra Nevada Mountains in Nevada and California, some 2,000 planes have been lost in the last 60 years. In this remotely populated area of more than 25,000 miles of mountain desert, many of the crash sites are never found. The triangle is typically defined as spanning from Las Vegas, Nevada in the southeast to Fresno, California in the west, and to Reno, Nevada at the top. Within this rugged wilderness is the mysterious, top-secret Area 51. 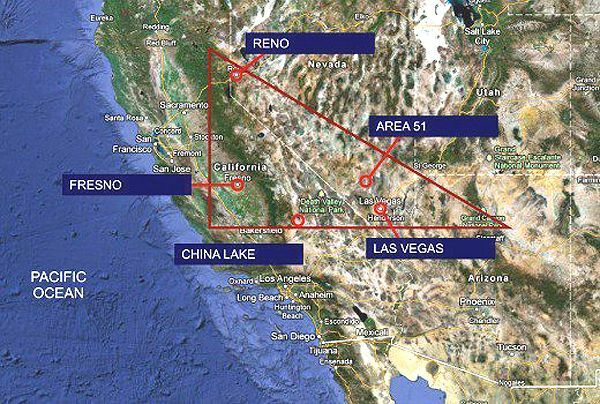 Along with the dozens of conspiracy theories which include UFO’s and paranormal activity that surrounds the air force base, similar theories have long been considered regarding the Nevada Triangle. Throughout these many years, many of the missing planes were flown by experienced pilots and disappeared under mysterious circumstances, with the wreckage never found. One such plane to go missing with that of a record-setting aviator, sailor, and adventurer named Steve Fossett on September 3, 2007. Fossett, flying a single-engine Bellanca Super Decathlon over Nevada’s Great Basin Desert, took off and never returned. After hunting for a month for the plane, the search was called off and on February 15, 2008, Fossett was declared dead. Later that year on September 29th, Fossett’s identification cards were discovered in the Sierra Nevada Mountains in California by a hiker. A few days later, the crash site was discovered—approximately 65 miles from where the aviator initially took off. Two bones were later recovered a half mile from the crash site which was found to have belonged to Steve Fossett. One of the earliest planes lost in the “Triangle” includes a story dating back 70 years when a B-24 bomber crashed in the Sierra Nevada mountains in 1943. The bomber, taking flight on December 5th was piloted by 2nd Lieutenant Willis Turvey and co-piloted by 2nd Lieutenant Robert M. Hester, carried four other crew members including 2nd Lieutenant William Thomas Cronin, serving as navigator; 2nd Lieutenant Ellis H. Fish, bombardier; Sergeant Robert Bursey, engineer; and Sergeant Howard A. Wandtke, radio operator. The flight was a routine night training mission taking off from Fresno, California’s Hammer Field destined to Bakersfield, California to Tucson, and return. 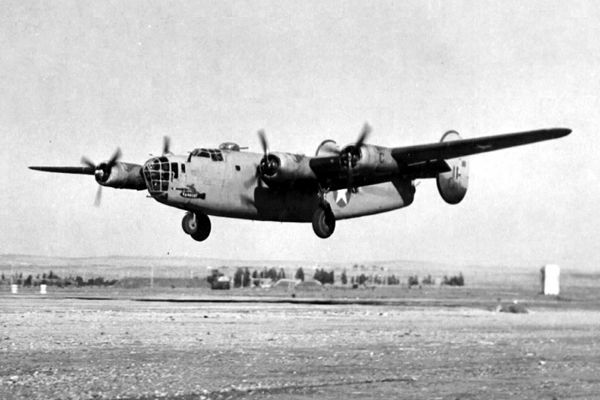 An extensive search mission began the very next day when nine B-24 Bombers were sent out to find the missing plane. However, rather than finding it, yet another bomber went missing. On the morning of December 6, 1943, Squadron Commander Captain William Darden lifted off along with eight other B-24s. Captain Darden, his airplane, and remaining crew would not be seen again until 1955 when Huntington Lake reservoir was drained for repairs to the dam. The investigation into the loss of the second bomber stated that Darden had experienced high wind turbulence and began to lose hydraulic pressure. When the captain saw what looked like a snow-covered clearing he told his crew to bail out but only two jumped. The investigation stated that the pilot must have mistaken the frozen lake for a clearing; however, the two soldiers who parachuted from the plane and survived made statements that the lake was not frozen. When the plane was finally found, it was resting 190 feet below the water with its five crew members still at their stations. In the meantime, Clinton Hester, the father of the co-pilot, Robert Hester in the first missing plane began a private search for his son that would last for the next 14 years. When he died of a heart attack in 1959, he still had not found his son or any evidence of the missing plane. A year later, however, it would be found in July 1960 by to United States Geological Survey researchers who were working in a remote section of the High Sierra, west of LeConte Canyon in Sequoia and Kings Canyon National Parks. There, they found airplane wreckage in and near an unnamed lake. 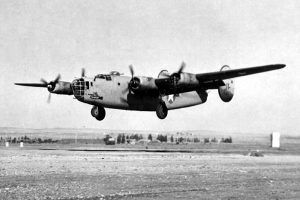 Later, Army investigators revealed the wreckage to be that of the first missing bomber piloted by 2nd Lieutenant Willis Turvey and co-piloted by 2nd Lieutenant Robert M. Hester. The lake is now known as Hester Lake. Another military plane went missing on May 9, 1957, when Air Force Lieutenant David Steeves was piloting a T-33 training jet. Taking off from Hamilton Air Force Base, near San Francisco, on a flight to Arizona, the plane disappeared. After a thorough search without success, the Air Force declared the 23-year-old pilot officially dead. However, 54 days later, the pilot reappeared. Guant and dressed in tattered and filthy clothing, he had made his way to a camp in the backcountry of Kings Canyon National Park, east of Fresno, California. He described that when something in the plane exploded he briefly black out, but came to in time to eject from the plane, badly injuring both ankles when he landed. Dragging his parachute to help him keep warm, he crawled over 20 miles in the freezing temperatures at 12,000 feet elevation for 15 days without food or shelter. Finally, he came upon an abandoned National Park Service cabin, where he found a few cans of food as well as a fishing equipment. He then survived by fishing and killed a deer with his pistol. After regaining some of his strength tried to make it to civilization, during which time, he nearly drowned in the Kings River, before stumbling upon a pack-train guide who took him by horse to civilization. Though clearly a brave man, there were some who questioned his story due to his disappearance occurring in the midst of the Cold War and because no remains of his plane could be found. It wasn’t until 1977 that Boy Scouts found the canopy of his jet, but the plane’s wreckage has never been found. In 1941 Lieutenant Leonard C. Lydon parachuted to safety after his Army fighter squadron got lost over the mountains. His P-40 fell within a mile of where he landed in the remote Sequoia and Kings Canyon National Parks. To this day the wreckage has never been found. Another famous case was of missing aviator Charles Ogle, a wealthy real estate developer who lifted off from Oakland, California in August 1964 but vanished en route to Las Vegas, Nevada. The Marine Corps trained pilot was never seen or heard from again and his plane has never been found. On July 11, 1986, Major Ross Mulhare flew an F-117 into a mountain near Bakersfield, California. The cause of the crash has never been officially revealed. So, what is it exactly that’s causing aircraft to go missing within the Nevada Triangle? Conspiracy theorists have long claimed the reason so many flights have disappeared is connected to the presence Area 51, where the US Air Force is known to test secret prototype aircraft. But, many experts believe the disappearances can be attributed to the areas geography and atmospheric conditions. 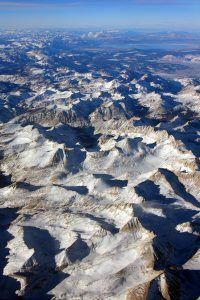 The Sierra Nevada mountains run perpendicular to the Jet Stream, or high Pacific winds, which conspire with the sheer, high altitude peaks and wedge-shaped range to create volatile, unpredictable winds and downdrafts. This weather phenomenon is sometimes called the “Mountain Wave” where planes are seemingly ripped from the air and crashed to the ground. Other theories include pilot error, inexperienced pilots getting caught in turbulence, and the disorienting mountain terrain. Compiled and edited by Kathy Weiser/Legends of America, updated December 2017. Of the 2,000 airplanes missing in the Nevada Triangle, how many are still missing and where can I obtain a list of missing aircraft.